What's the Best Compact SUV of 2019? With a killer combination of affordability, utility and fuel economy, the juggernaut compact SUV class is partially responsible for marginalizing the classic family sedan. 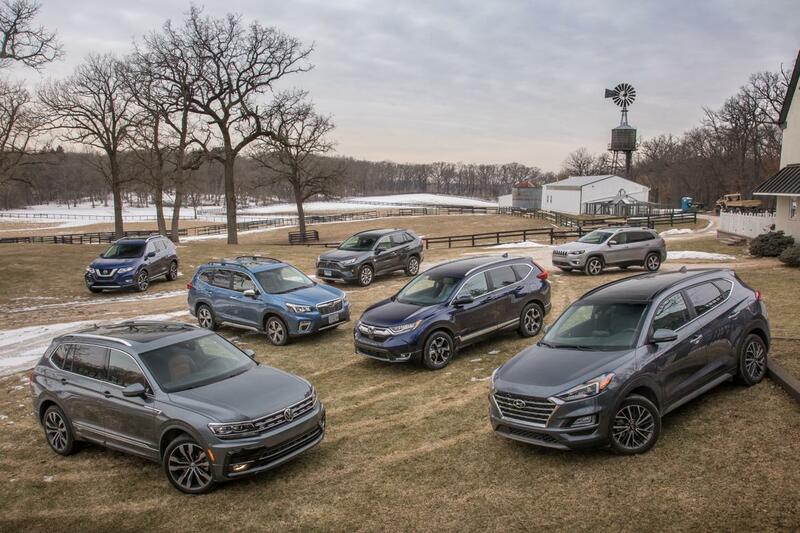 Perhaps the most recognized small SUVs in this class are the eternally feuding Honda CR-V and redesigned-for-2019 Toyota RAV4, which we tested in a multiday comparison along with five other 2019 models: the updated Hyundai Tucson, updated Jeep Cherokee, Nissan Rogue, redesigned Subaru Forester and defending champion of this test, the Volkswagen Tiguan. We focused the test on SUVs updated or redesigned since our last compact SUV test in 2017 and invited back podium finishers (Tiguan, CR-V and Mazda CX-5). Mazda declined participation this time. We targeted higher-end trim levels with volume-selling engines that offered the most similar features, which meant a V-6 for the Jeep Cherokee and four-cylinders (two turbocharged) for the others. Every SUV included all-wheel drive, forward collision warning with automatic emergency braking, a moonroof, in-dash navigation, dual automatic climate control and more. All included Apple CarPlay and all but one had Android Auto. Pricing spanned $34,000 to $40,000. We determined the winner by scoring categories including front and backseat comfort and amenities, interior quality, cargo provisions, fuel economy, child-safety seat fitment, safety and autonomous features, handling, braking, ride quality and value. You can read more about our testing methodology and categories in our How We Tested article. None of these are bad SUVs — even last place wasn't far behind most competitors, especially in the subjective categories we judge. Every SUV except for one topped the rest of the field in at least one category. Rather than look at just the winner, we recommend that you find the SUV that's excellent in a way that's important to you. 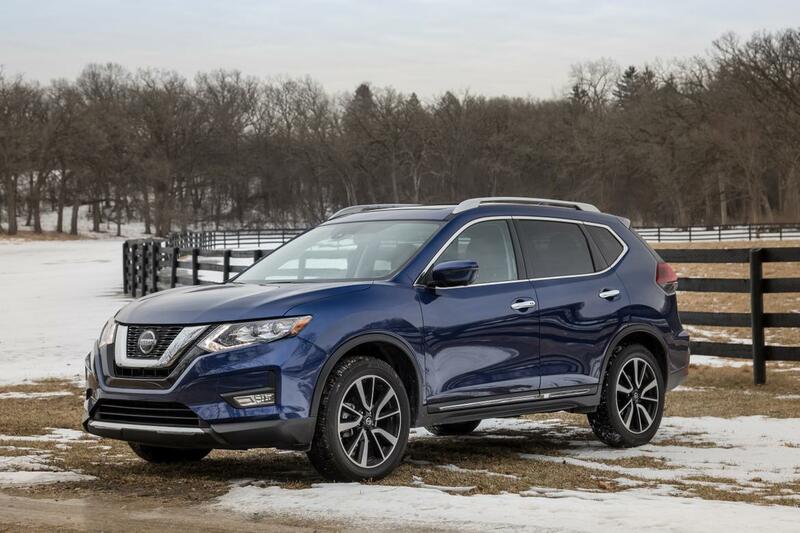 The verdict: Nissan has kept the Rogue viable in important respects, such as modern active-safety features, but it shows its age in interior design, loose driving dynamics and raucous transmission behavior. The Rogue may not have led any categories, but it was runner-up in many, including front-seat comfort and safety and autonomous features. A voluminous interior also helped some of its scores. What bruised the Rogue was that it scored the lowest in the most categories: interior quality, in-cabin storage, handling, braking and powertrain (tied with the CR-V). It accumulated the least points from judges in seat-of-the-pants subjective scoring. Safety and autonomous features: "Though the Rogue is one of the oldest-generation models in the Challenge, you wouldn't know it from the safety features, which earned it a rank of second in this category, only one point behind the RAV4," said Wiesenfelder. The Rogue lacked front parking sensors that gave the RAV4 the win but had lane-centering steering all the way to a stop, exclusive to the Rogue and RAV4. Front seats: "Front-seat headroom is especially exceptional — even with the available panoramic moonroof. This is partly a function of Nissan limiting driver's-seat height adjustability, but I was still able to find a comfortable driving position," said Hanley, who's 6 feet tall. Cargo: The Rogue was just 2 points behind the CR-V and Tiguan, which tied for first in this category. Though its cargo volume behind the backseat is average, the seat slides forward, folding down the center armrest opens a pass-through and there's a kick-activated power liftgate. Rear seats: "The roomy backseat slides and reclines, and it has a comfortable cushion height," said Meier. "It's no penalty box for adults sitting back there." Handling: "A vehicle can exhibit body roll without compromised traction, but the Rogue had both, especially in evasive maneuvers," Wiesenfelder said. "The steering is also uninspiring." Powertrain: "The Rogue has by far the worst-behaved CVT in the Challenge, with a rubber-band lag off the line and raucous noise that intrudes even at highway speeds on a grade or in passing," said Meier. Modest overall power and delayed acceleration response during passing contributed to the low score. In-cabin storage: Judges used the cupholders as storage space because the Rogue lacked more useful areas for devices and such, leaving no room for drinks. "There is a shallow space at the front of the center console where you might put a phone, but it's neither the shape nor the size of a phone," said Meier. Interior quality: Inconsistent materials plagued the Rogue. Where some look fresh and high-quality like the stitched dashboard inserts, others didn't. "Our SL's leather upholstery (or perhaps the accompanying vinyl panels, a common mix) had a low-rent sheen, and the craftsmanship was shoddy in the form of anomalous tucks and bunches," said Wiesenfelder. Noise: "Please fix the CVT, Nissan," Meier pleaded. "When you step on the gas, it howls like you stepped on its tail." The verdict: The Cherokee's upscale interior and V-6 power feel a price class higher than the competition, but the cramped backseat and limited cargo room seem a size class lower. Jeep has a sizing issue with its small SUVs. The Jeep Compass in our previous test didn't do great. 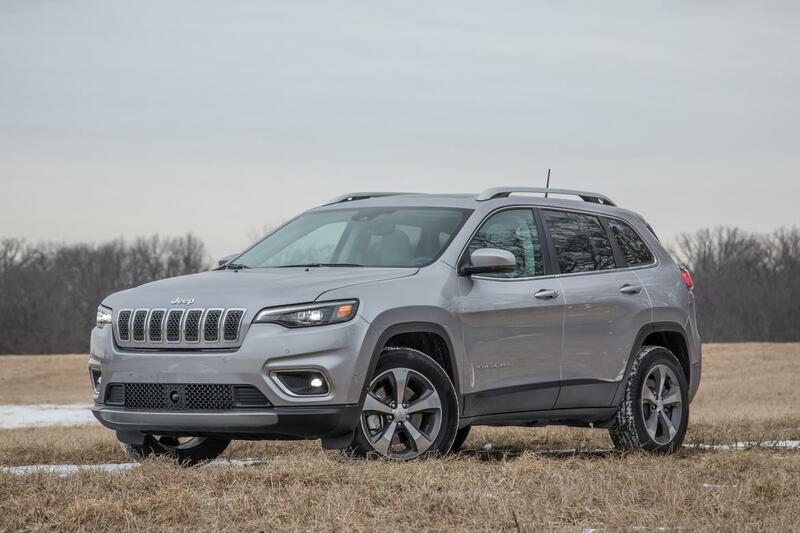 The larger Cherokee carries the Jeep flag this time, but again, the updated 2019 Cherokee fell short in measured cargo room and front and backseat comfort. However, it bested the field in powertrain scores thanks to its unique V-6, plus top-of-the-heap ride quality. Engine and transmission: "The power feels robust and eager, and the feels engine smooth," said Wiesenfelder. "Unlike the Cherokee's standard four-cylinder, this engine seems to minimize the nine-speed's harshness and lag. This class is characterized by modest power and lazy, droning CVTs, so the V-6 Cherokee stands way out." But the Jeep's automatic isn't completely off the hook — it clunked once during an upshift before it had warmed up fully. Ride quality: "The Cherokee's suspension refinement impresses. Tuning is firm, but it doesn't get flustered or become harsh when you hit a rough patch," said Hanley. Interior quality: The Cherokee was part of a three-way tie with the CR-V and Tiguan for the highest-scored interior quality. "I think Cherokee has the most luxurious interior in this group — the most upscale design, nicest leather, nicest stitching and the least hard plastic anywhere you touch," said Meier. Multimedia and controls: "The optional 8.4-inch Uconnect touchscreen is a favorite for its size, ease of use and customizable home row of icons, which kindly stay at the base of the screen even when Android Auto is running," said Wiesenfelder. Meier called it "the power player, with the only household electrical outlet and a pair of the latest USB-C ports along with four legacy USB connections." Noise: "Packing plenty of power and a conventional transmission, the Cherokee was free of the grating engine noise of some contestants," Wiesenfelder said. Cargo: Though it included a sliding backseat, underfloor storage and a foot-activated power liftgate, the Cherokee couldn't overcome its lowest measured volume and thus ranked last. Value: The Cherokee was the second-most expensive SUV in the test, but judges didn't feel it offered enough for the money even with a powerful V-6 that managed to beat two of the four-cylinders in our real-world fuel economy test. It had the fewest safety and autonomous features, the lowest measured cargo room and was still more than $40,000. Front seats: Though one dissenting judge had no complaints, the Cherokee's front seats accumulated the fewest points. "My legs felt more crowded than in the others, with my knees banging the steering column when sitting as high as I wanted to be," said Wiesenfelder. "Two of us noted an irritating bump halfway up the backrest." Rear seats: Backseat comfort for our tall judges wasn't great. "If you need the rear seat for adults, this is not the choice. The backseat slides and reclines, but I still couldn't fit behind a driver my size (I'm 6-foot-2), and my head bumped the headliner at the side and rear," said Meier. Braking: "Numb, mushy brake-pedal feel is more trucklike than SUV-like and disappointing overall," Hanley said. Only the Rogue's brakes earned fewer points. The verdict: The redesigned RAV4 has a quality interior, strong engine and a complete package of standard safety and driver assistance tech, but it's let down by the rest of its driving experience. How would the complete retooling of the classic RAV4 stack up against the field? Fifth place may not look great, but it bears noting that the 2018 model probably would have trailed the entire pack — and that the competition also upped its game in a big way. The RAV4 scored just barely below the CR-V but cost nearly $4,000 more without many discernible advantages. Safety features: The RAV4's safety features and autonomous features topped the field. "Toyota was slow to catch up with the most advanced active-safety and semi-autonomous driver assistance features, such as adaptive cruise control that works all the way to a stop and effective lane-centering steering, but catch up it has," said Wiesenfelder. Fuel economy: The RAV4's observed 29 mpg bested the rest in our 215-mile fuel economy loop of mostly highway driving. Multimedia and controls: "I marked the RAV4 down considerably for being the sole Android Auto holdout, but it's impressive in many ways, including a simple control layout. The large 8-inch touchscreen sits high and features mechanical buttons and rubberized knobs. There are five USB ports total," said Wiesenfelder. Hanley echoed the importance of the screen's location: "It's right in the driver's line of sight, which makes it easy to see at a glance." In-cabin storage: "Useful cabin storage includes a phablet-size device bin below the dashboard and thoughtful in-dash shelves above the glove box and to the left of the steering wheel," said Meier. Wiesenfelder said, "It's hard to deny the usefulness of an open shelf like this that's so visible you won't accidentally leave something behind." Noise: "With a new platform and design, I didn't expect the same old wind and road noise, as well as the coarse sound of the engine and transmission," Meier said. Some judges likened the droning of the engine to a CVT despite the RAV4's transmission being an eight-speed automatic. Rear seats: Previously a strength of the RAV4, the redesign's peculiar positioning of the rear seat decreased its comfort. "There's good headroom in the backseat, but the seat itself is too close to the floor, resulting in a knees-up seating position that isn't comfortable," said Hanley. The RAV4 tied the Jeep Cherokee for the lowest rear seat score. Ride quality: "The ride was borderline rough both in the city and in freeway cruising," said Meier. 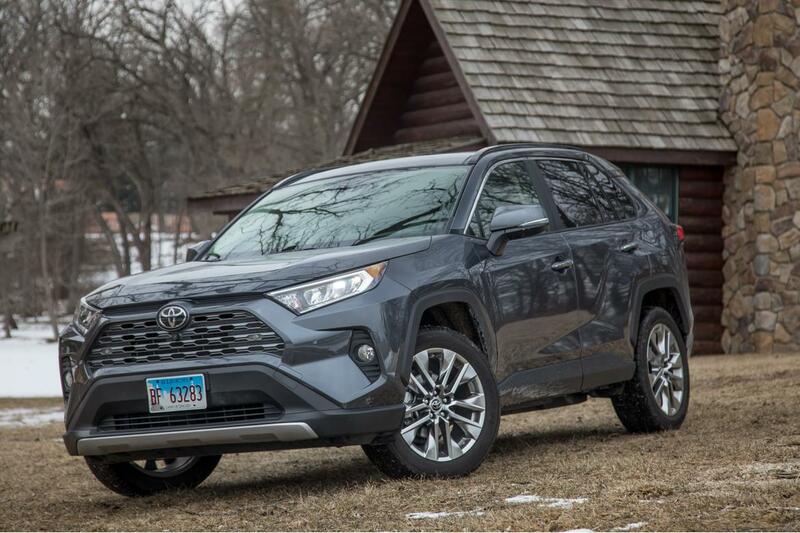 The RAV4's ride tied for last rank with the CR-V.
All-wheel drive: Judges liked the powerful four-cylinder engine, but the transmission and all-wheel drive disappointed. "This was the only all-wheel drive that felt reactive to me, allowing the front wheels to slip before engaging, even with Snow mode activated," said Wiesenfelder. 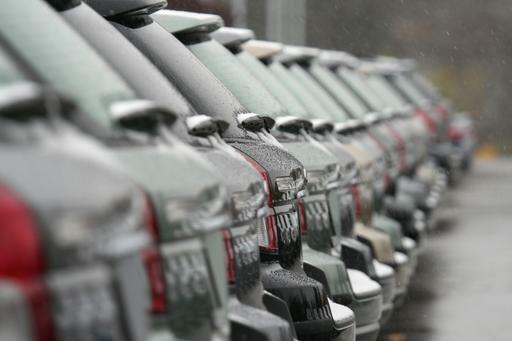 "Is this how it trounced competitors in our mileage drive? If Toyota could give us the driving feel of the VW or Hyundai along with mileage superior to the CVTs in this test, I'd give it 10 points." The verdict: Some others are more enjoyable to drive, but the CR-V is the pick for the carpool lane with the most cargo space, innovative cabin storage, family features and high gas mileage. The CR-V is still just as family-friendly and value-packed as before, but it slipped from second place in 2017's test to fourth simply because the competition stepped up. The CR-V trounces other small SUVs in space efficiency with exceeding cargo and backseat room, plus unrivaled center console storage that's more minivan-like than compact-SUV-like. What hurt this time was how it drives, made apparent by the more refined and quieter rides of the more recently updated SUVs. In-cabin storage: Device-dependent families will appreciate the CR-V with a place for just about everything. "The CR-V still is the best choice here for family hauling, with the useful spaces for your devices and stuff," said Meier. "The clever configurable console can have multiple spaces and a tray or be opened up to swallow a medium purse or diaper bag." Cargo space: "Even though it has a fixed rather than sliding backseat, the CR-V had the most cargo volume by our measurements — without compromising passenger legroom," said Wiesenfelder. The cargo opening is low, wide and easy to load and remove gear. Rear seat: The backseat didn't recline very much or slide, but that didn't keep it from having the second-highest score in the test. "There's plenty of headroom and, unlike the RAV4, the CR-V doesn't achieve it by placing the seat too close to the floor and raising the passenger's knees," said Wiesenfelder. Fuel economy: With observed mileage of 28.5 mpg in our road-trip testing, the CR-V was just half an mpg behind the top-rated RAV4 thanks to an upgraded engine that's both more powerful and more efficient than the CR-V's base 2.4-liter four-cylinder. Multimedia and controls: The courtesy volume knob added with 2017's redesign helps but isn't a fix to a convoluted menu system and hard-to-use touch-sensitive controls, which resulted in a lowest-in-class score. There is a good Honda multimedia system, but it's only in the Accord. The CR-V was also the only model with Android Auto that took as much as a minute to reconnect with a Samsung Galaxy smartphone — and twice failed entirely. 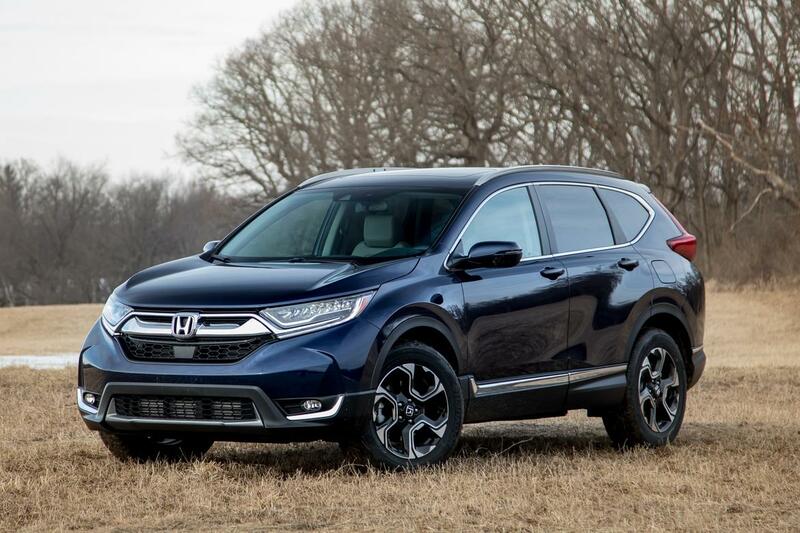 Ride quality: Tied with the RAV4 as lowest-in-class, the CR-V's ride didn't do it any favors. "The suspension doesn't feel unsophisticated, but it's firmer than I want for our region's roads," said Wiesenfelder. The reward was a tight, responsive handling experience second only to the winner, but the Tiguan didn't give up as much in ride quality. Powertrain: Matching the Rogue for lowest powertrain score, the CR-V lost points for its unacceptable, unresponsive acceleration from a stop. "Stomp on the pedal and it does practically nothing for two or three seconds," said Wiesenfelder. "So long as you don't rush a left turn with oncoming traffic, you might not notice it, but learning that lesson can be hair-raising." Responsiveness is better once moving, but getting there makes a racket. "This powertrain feels like it's working the hardest of all the ones here," said Hanley. "It delivers a lot of noise but only modest power." Unavailable frills: "With a price at the lower end of the field and a wealth of thoughtful features, the CR-V is a real value for smaller families. But you'll have to do without some newer amenities, like a panoramic moonroof, a heated steering wheel or a 360-degree camera — features that some or all rivals have at this price level," said Meier. The verdict: The Tucson is a good all-around choice made more competitive for 2019 with a smoother powertrain, more standard safety technology and exceeding value. If the Tucson hasn't been on your list — it hadn't been on ours after finishing last in 2016's test — then 2019 is the year to put it back on. 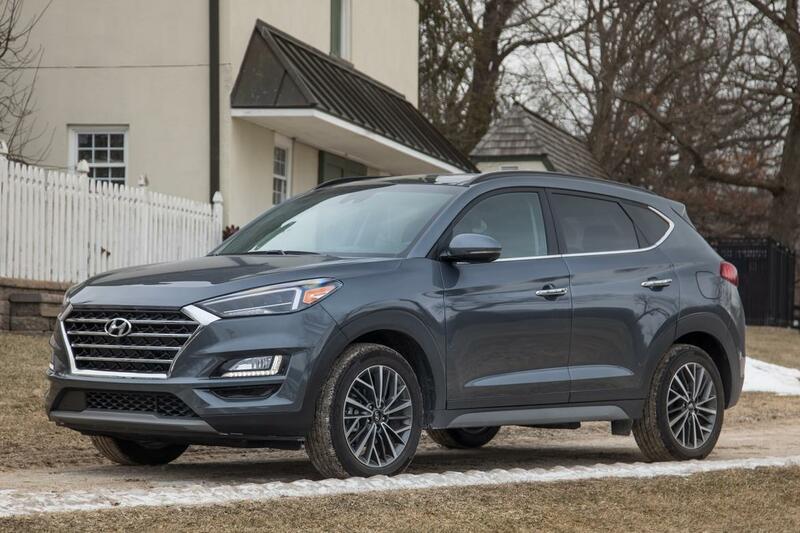 It won only one category, but the Tucson performed admirably in just about every ranking thanks to 2019's update that replaced a spastic engine and transmission with a more traditional setup and added more standard safety features and a new, larger touchscreen. Value: The Tucson topped value, and by no small margin. "You wouldn't know the Tucson was the lowest priced in our test from the included features or a generous warranty that's second only to the Tiguan's," said Wiesenfelder. "It included eight-way power seat adjustments for the front passenger as well as the driver, heated seats front and rear, ventilated front seats, a panoramic moonroof and many other goodies found in the higher-priced examples." The only feature missing was a memory driver seat, which all others had. Ride quality: "Ride quality never used to be a Hyundai strength, but the brand has come a long way," said Wiesenfelder. "The Tucson has a reasonably comfortable and controlled ride on sensible 18-inch wheels." The Tucson ranked second behind the Cherokee here. Multimedia and controls: "The Tucson's dashboard controls are sensibly arranged, and its touchscreen multimedia system is easy to use," said Hanley. "It's in my line of sight and within easy reach," added Meier about the 7-inch system. The Tucson tied for second rank with the Cherokee in this category. Drivetrain: "The 2.4-liter engine and conventional six-speed automatic transmission that replaced the former turbocharged 1.6-liter and dual-clutch automatic on higher trim levels are a smoother and better fit for the Tucson," said Meier. While improving over the previous Tucson, its consistent performance also exceeded the drivability of many other transmissions in this test. City-friendly size: At 176.4 inches long, the Tucson is the shortest contestant by several inches, giving it an advantage for smaller garages and tight parking situations. Child-safety seat fitment: Points lost in car seat fitment testing included having to move the front passenger seat farther forward to accommodate the infant and convertible rear-facing seats, impacting front passenger room. 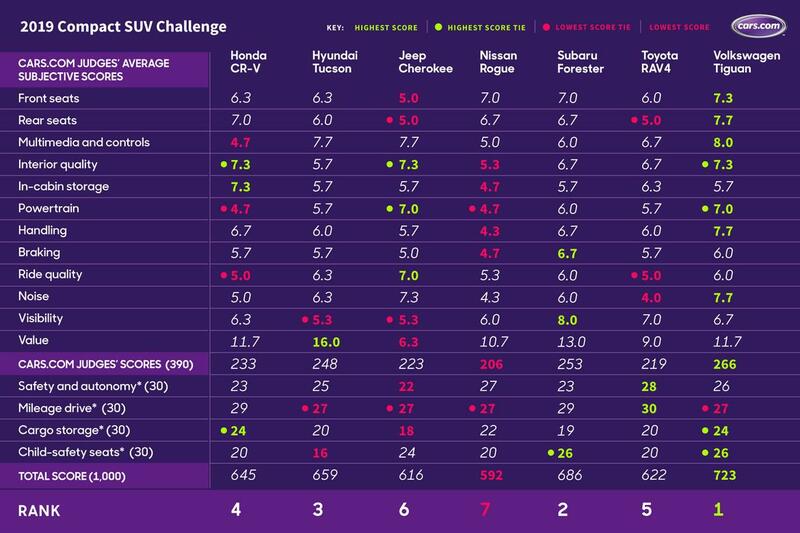 Visibility: The Tucson tied the Cherokee for the lowest visibility scores. Meier explained: "A rising beltline in the rear doors and teeny rear side windows limit visibility to the rear corners." Fuel economy: The new engine and six-speed transmission (versus seven gears last year) tied with the Rogue for the lowest observed mpg of the group in our fuel economy route, even lower than the V-6-powered Cherokee that has 90 more hp and more than 200 additional pounds. Interior quality: "The redone interior still has too much hard grained plastic, and the monochrome black with matte trim on the test car is almost funereal," said Meier. Wiesenfelder added, "Elements like the simple gauges and instrument panel display pass without notice on lower Tucson trims, but they're out of place in this company. The Ultimate could be more ultimate." The Tucson ranked a close second to last above the Rogue. The verdict: The Forester does most things reasonably well and almost nothing poorly, resulting in a well-rounded, appealing compact SUV. In our 16 test categories, the redesigned Forester didn't score lowest in any test, which not even the overall winner could claim. And that's with a CVT, which is impressive considering the other two CVT-equipped SUVs disappointed in some regard. 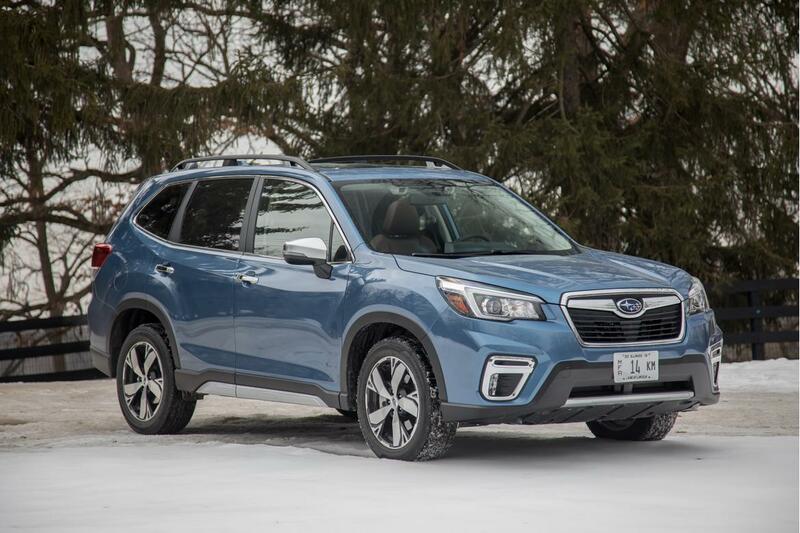 The 2019 Forester is roomier, more luxurious and drives more refined than the 2018 despite an appearance that looks nearly identical. Visibility: An old-school safety feature, the Forester's visibility earned top marks. "It's a cut above with a low beltline and tall windows that improve outward visibility in all directions, which is especially helpful while parking and navigating close quarters," said Wiesenfelder. Braking: "The Forester's strong-feeling brakes might be the best of the lot," said Wiesenfelder. Colleagues agreed; it earned the top score. Child-safety seat fitment: The Forester tied for the highest car seat fitment score. Generous backseat roominess allows the rear-facing seats to fit without sacrificing much front passenger room, and the Forester got an extra point for an additional Latch anchor point between the main outboard sets. Handling: For its type, the Forester is fun to drive and placed behind only the Tiguan in our handling evaluation. Hanley explains, "Despite offering 8.7 inches of ground clearance, the Forester feels like it has a low center of gravity, and this lends it a nimbleness on winding roads." Wiesenfelder added, "The Forester has minimal body roll; it corners exceptionally flat in this group." CVT: Don't let this continuously variable transmission deter you too much after reading about the other CVTs in this test. "It's well-tuned and includes seven artificial gear steps along with paddle shifters for more control. There is expected CVT lag off the line, but the Forester does not feel underpowered," said Meier. Controls: Detail-oriented buyers might have a panic attack using the Forester's many — sometimes redundant — controls and buttons. 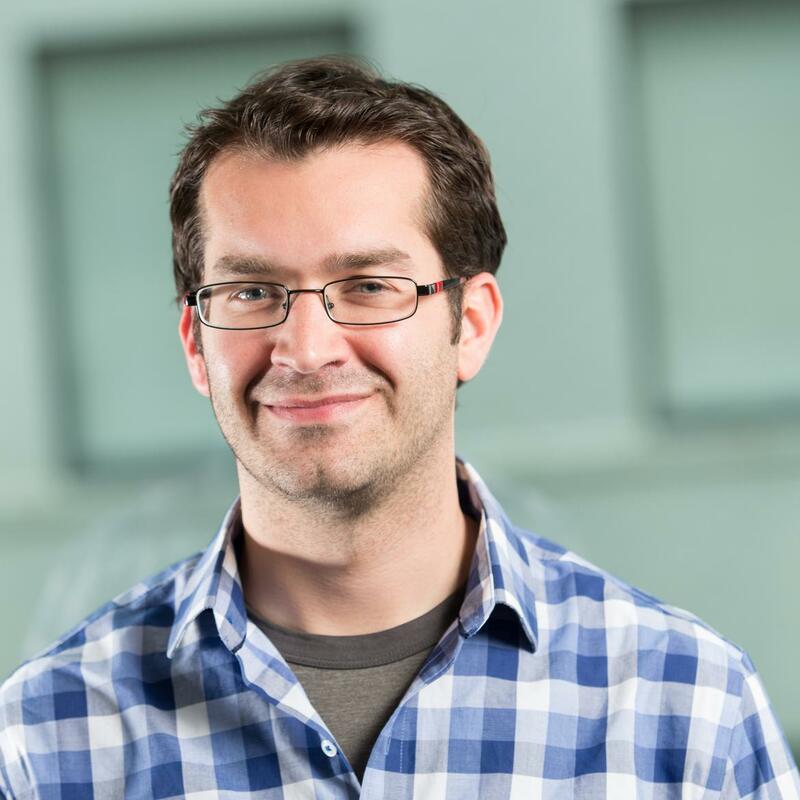 "The media system is intuitive, fast and sharp, but an almost random scattering of the many knobs, switches and buttons is a bit overwhelming," said Meier. Wiesenfelder agreed: "Buttons for similar features end up in two different places, such as two driving modes on the steering wheel and two all-wheel-drive controls (which are also driving modes) on the center console." Cargo: The Forester was just one point ahead of the last-place Cherokee due to modest measured cargo volume and a backseat that doesn't slide. Steering: "Despite what I said about its good body control, I couldn't get past the Forester's vague, wandery steering — one way the CR-V has it beat," said Wiesenfelder. The verdict: The Tiguan returns as champion on the strength of how it drives, and you give up nothing in roominess, media, safety tech and cabin comfort for it. The Tiguan's win is a decisive victory against the newest and best-selling in the class. It topped or tied in a staggering nine out of 16 categories: front seats, rear seats, multimedia and controls, interior quality, powertrain, handling, noise, cargo storage and child-seat fitment. It was the most expensive, but that isn't a guarantee of success (see where the Cherokee placed). The contest's most generous warranty is one factor that helped compensate in the VW's value score. The Tiguan landed on the lower end of our fuel economy test, but its scorecard is otherwise littered with wins. Seating: No other compact SUV offered as much front and backseat room. "The sliding and reclining split second row creates a really comfortable backseat for grownups," said Meier. 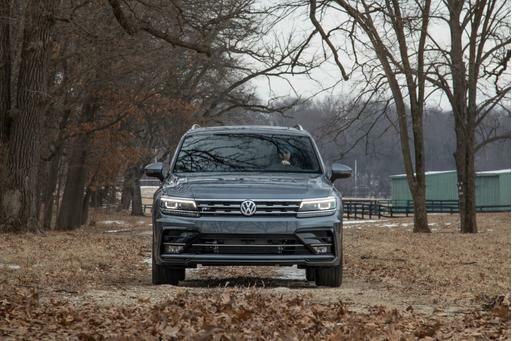 Judges found the "just right" adjustability they were looking for: "In addition to having supportive, comfortable cushions, the Tiguan's driver's seat was the only one that let me sit as high as I wanted, with full thigh support," said Wiesenfelder. The only bummer was missing power controls for the passenger, an oddity in the class and at this price. Multimedia and controls: "I don't care for the touch-sensitive buttons along the touchscreen, but otherwise the system is good, with quality maps, high-resolution camera views, clear menus and additional icons that pop up when you reach toward the screen — which maximizes visual real estate for other content when you don't," said Wiesenfelder. Hanley called out the Tiguan's all-digital instrument panel as "stylish, sophisticated and nice enough to be in a luxury vehicle." Noise: "What noise?" Meier mused. "The Tiguan had the quietest cabin of the group under all road and weather conditions." Drivetrain: No pair was as well-matched as VW's engine and transmission. Wiesenfelder explains: "In a field with several CVTs, an ill-behaved eight-speed (Toyota) and a nine-speed (Jeep) that gets along only with a V-6 upgrade, the Tiguan's gearbox is a breath of fresh air that doesn't sacrifice efficiency as much as the other praiseworthy step-gear transmission, Hyundai's six-speed." 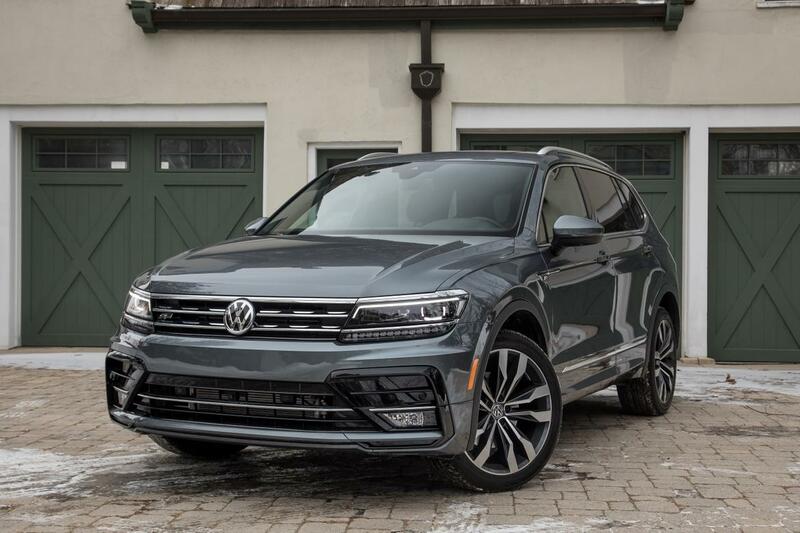 Ride and handling: "Responsive, light-effort steering and tightly controlled body motions make the Tiguan driving experience more like a sporty hatchback's than a compact SUV's," said Hanley. Wiesenfelder added, "Fortunately, VW's inclusion of the R-Line Package and its unnecessary 20-inch wheels didn't destroy the ride quality, though it might be even better with 18s or 19s. Our Tiguan rode well enough and handled with poise and confidence," said Wiesenfelder. Fuel economy: It may have been the Tiguan's worst showing, but its 26.5 mpg in our road-trip test was ahead of the Tucson and Rogue (both 25.7 mpg) and the Cherokee's 26.1 mpg. For an SUV of the Tiguan's size in the land of cheap gasoline, it's not too bad. In-cabin storage: For all of its passenger space, there isn't much room for devices. "The Tiguan's giant door pockets are impressive, but it comes up short on covered storage," said Wiesenfelder. "The center console storage box is the smallest in the group, and the glove compartment is smaller than it looks from the outside." Third row: The optional third row both hurt and helped. It reduces cargo volume versus a Tiguan without this seat, though our test vehicle still tied for first rank with the CR-V thanks to the versatility of the second row's sliding adjustment and a 40/20/40-split backrest that allows long, narrow items to be carried between two seated second-row passengers. The third row added a point to the child-safety seat score simply by existing. But in the end, we'd skip the three-row model. Meier explained: "The way-back third row is tiny and cramped even for kids and sits you on the floor. It's optional on this AWD model and I wouldn't spend the $595 for it." Wiesenfelder agreed: "All the third-row seat did was diminish the cargo score and add to the Tiguan's price." Interior quality issues: Though the Tiguan was in a three-way tie for first rank with the Cherokee and CR-V, a few things drew criticism from the judges. "The center console has sharp hard-plastic edges that will annoy drivers with a wide stance (note to VW to check out the Forester's padded console edges), and the genuine leather has a bit of an imitation leather feel to my hand," said Meier. Wiesenfelder agreed that "it has many strengths, but the Tiguan's interior design continues to strike me as too austere. I used to think color would help VW, but the orange seat inserts seem out of place." 2019 Compact SUV Challenge: How Do the CR-V, Rogue and Others Compare to the Tiguan?